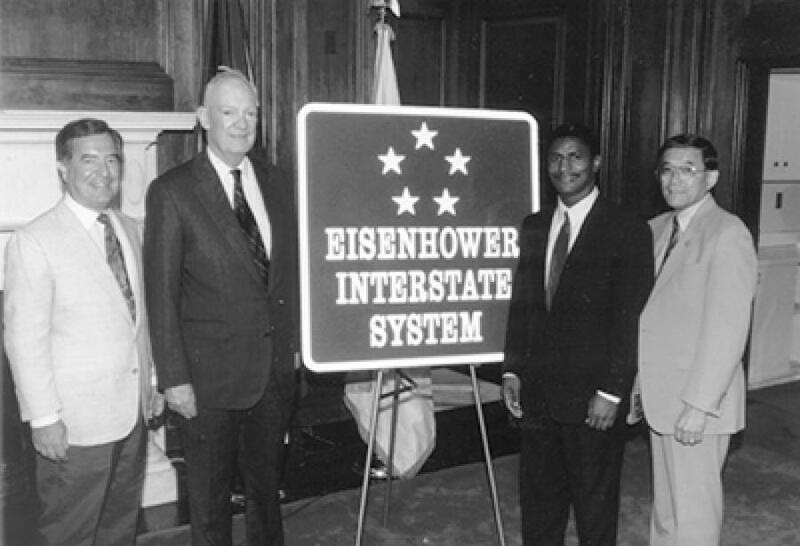 The road sign for the Dwight D. Eisenhower National System of Interstate and Defense Highways, designed by FHWA and the American Association of State Highway and Transportation Officials, was unveiled in a ceremony on Capitol Hill on 7/29/93. Left to right: Chairman Nick J. Rahall (D-WV) of the House Surface Transportation Subcommittee, John Eisenhower, Federal Highway Administrator Rodney E. Slater, and Chairman Norman Y. Mineta (D-CA) of the House Committee on Public Works and Transportation. IDAHO FALLS, Idaho (AP) It's been 60 years since the National Interstate and Defense Highways Act became law. The law, championed by President Dwight D. Eisenhower and broadly supported by both parties, led to the construction of 41,000 mi. (65,983 km) of wide roads that allowed high-speed travel for people and goods. The Interstate Highway System revolutionized the American economy, diet and travel habits, reported the Post Register. And the biggest changes were felt in places like eastern Idaho, where small, spread-out towns could be several days' travel from major trade and manufacturing centers. “Small town America has been diminished as a result of the freeways,' said Rep. Linden Bateman. Eisenhower came to support the idea of an interstate system while leading American forces in the European theater during World War II, as a U.S. Department of Transportation history recounts. Germany already had an interstate-like system: the Autobahn. America was mostly crisscrossed with a network of two-lane roads, and in 1919 Eisenhower had participated in an Army convoy moving troops from Washington, D.C. to San Francisco. That movement impressed him, but he saw a greater value in the Autobahn's large, multi-lane roadways. “The old convoy had started me thinking about good, two-lane highways, but Germany had made me see the wisdom of broader ribbons across the land,' Eisenhower remarked. A variety of plans for a possible system of that type had been circulating in federal agencies since the 1930s, but Eisenhower's backing pushed the massive public works undertaking toward reality. It was helped along by members of both political parties, including Sen. Albert Gore Sr. and Sen. Prescott Bush — the fathers of Vice President Al Gore and President George H.W. Bush. The act set in motion one of the largest public works projects in human history, one which would last from 1956 into the 1990s. “More than any single action by the government since the end of the war, this one would change the face of America,' Eisenhower later wrote. Bala began his career in the late 1980s. That was just in time to participate in some of the final extensions of the interstate system in eastern Idaho, such as completing the last stretch of Interstate 15 connecting Idaho to Montana. Prior to the interstate system, when most goods were shipped by train, most stores received shipments only intermittently. So they had to have large warehouses where they could store goods for a long period of time, in order to be sure they would have sufficient stock for their shelves. Jason Andrus, chief financial officer of Doug Andrus Distributing, said that delivery model was unthinkable before the interstate. Doug Andrus Distributing, which started in 1937 with a single truck, today has a fleet of nearly 300 trucks and employs hundreds of eastern Idahoans, paying about $50 million annually in salaries and benefits. The distribution of goods has become so reliant on reliable just-in-time delivery via interstates, that most stores have done away with those large warehouses. Bateman, who attended Brigham Young University, remembers what it was like to travel from Idaho Falls to Provo, Utah, before the advent of the interstate system. It meant traversing a network of narrow state highways that took a traveler through the middle of small towns. For many years, visitors to Yellowstone National Park coming north from Utah had one main route: U.S. Highway 91, which passes through the middle of Blackfoot, Firth and Shelley. All that traffic meant a constant stream of potential customers for small, local businesses. “I remember how lively the little towns were before the freeways came in,' Bateman said. “Firth had some really neat establishments. They had a huge antique barn, and people would come in and stop there. The interstate system wasn't the only factor in the declining business climate of many small towns. A contemporary shift from small family farms to industrial agriculture also had a negative impact. But the interstate was undoubtedly a key factor. The build-out of the interstate system created an explosion in car travel. In 1960, as interstate construction was getting under way, the average American travelled about 7,000 miles on the road every year, according to U.S. Department of Transportation data. By 1990, when the system was essentially complete, that had climbed to about 14,000 miles. When the portion of Interstate 84 that passes through Boise was complete, it saw about 25,000 cars a day, according to Bala. Today, it's about 120,000. In eastern Idaho, the Transportation Department's automatic traffic counter on I-15 at Rose Road in Bingham County shows that daily traffic has increased steadily for the last two decades. In 1999, the oldest data available, about 17,000 vehicles passed that site daily. Last year, traffic at that counter increased to a record 22,000 vehicles per 24 hours. Through the first six months of this year, that stretch is seeing an average of 700 more cars per day than it did a year ago. The 26,000 vehicles per day that passed that point in June was the second highest number on record, trailing only July 2015. Those vehicles are also moving faster than ever. Older drivers will remember that the national speed limit on interstates was 55 mph, an effort to reduce fuel consumption following the 1970s oil crisis. That speed limit remained in place until the late 1980s when it was raised to 65 mph. It increased to 75 mph on most stretches of Idaho interstate in 1996 and was raised to 80 mph in Idaho in 2014. With today's improved roads and higher speed limits, drivers can go from Idaho Falls to Salt Lake City in about three hours. Bateman said sometime around 1919, his grandfather took a train down to Salt Lake City to buy his first car. The drive back took him several days. “It's just a miracle that you can get in a car, go down to Salt Lake, and get back in a day,' he said. And road travel has become much safer since the advent of the interstate system as well. In 1956, about 6 people died for every million miles of vehicular travel, according to Department of Transportation statistics. By 2007, it was about 1.4 people per million miles. “You just have to wonder: In the next 50 years what else will improve?' Bateman said. Bala has a darker view. In recent years, the interstate system has struggled with a persistent funding shortfall. Maintenance on the interstate system is mainly paid for through the Highway Trust Fund, which receives most of its funding through federal taxes on gasoline and diesel fuel, which haven't been raised since 1993. Cumulative inflation over that period has eroded 40 percent of the value of those taxes. Last year, the Highway Trust Fund was projected to run completely dry with $8 billion in maintenance left undone. Congress responded with a $52 billion injection of funds to keep it afloat. But that only delayed the problem. The fund is expected to receive revenue of only $35 billion to $38 billion each year for the next decade, while costs are expected to run from $44 billion to $52 billion per year. So the fund is expected to run out of money again in 2022, unless it receives another injection or Congress enacts a fuel tax hike.